You can “try us out” with our convenient 90-day initial terms followed by month-to-month lease and an all-inclusive lifestyle, including 3 chef-prepared meals, weekly housekeeping, utilities, maintenance, transportation, GPS-enabled 2-way communication emergency call button, activities, travel program, and so much more included in your monthly rate….and should the need arise, our residents are welcome to age in place by hiring the home health agency of their choice. You can “try us out” with our convenient 90-day initial terms followed by month-to-month lease and an all-inclusive lifestyle. Computer services to keep your home and business running smooth. Help is just a phone call or email away. Kids Eat for FREE....Even College Students! Getting Kids to Eat Their Fruits and Vegetables has never been easier! 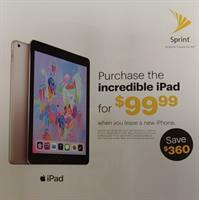 Get the iPad 6th Generation for only $99 with Unlimited Data! Visit the Sprint Store in Derry NH or call 603-434-5355 for details!